Do you know the story of 春日めぐみ (Megumi Kasuga) or 佐々木偵子 (Sadako Sasaki)? They are two young Japanese girls that were about the same age when they each had a tragedy in their life and how they reacted made them both famous in Japan. Megumi Kasuga was a thirteen year old junior high school student in 茨城県 (Ibaraki Prefecture, Japan) when her father died of cancer. In memory of her father, who wanted to travel overseas on holiday…but never got the chance, Megumi wrote a letter explaining that she hoped people around the world would take her favorite teddy-bear on a world journey. She gave the letter and the bear to an American visitor in Japan, who in turn gave it to a Swedish tourist in America…who then gave to another tourist when she got back to Sweden. And the bear’s journey began. Megumi received letters from people all over the world wishing her well. Some people were so touched by her story that they came to Japan to meet young Megumi in person. I’m a seventh grade student in junior high school. I’m 13 years old and live in Kashima City, Ibaraki Prefecture, Japan. Kashima is located on the Pacific coast, to the northeast of Tokyo. It takes about two hours by car from here to Tokyo, and about one hour to Narita (New Tokyo) International Airport. Soccer is very popular in Kashima. Our city is the home of the only Japan League professional soccer team in Ibaraki Ken, the Kashima Antlers. My father, at age 52, died of pancreas cancer on April 26 of this year, 1996. He loved to travel, but he didn’t have a chance to travel abroad, except his honeymoon in Hawaii. He was always very busy as a doctor at his hospital. He was also one of the team doctors for the Antlers. I would like to send this little hand-made teddy bear around the world to carry my father’s spirit to all those places that he never could go. My mother and I share this dream. Would you please help me, and take him with you? When you get to your destination, please give Mack to another person so that he can continue his journey. That way, my father can finally see the world through Mack’s eyes. Thank you for your kindness. May your dreams also come true. P.S. If you can, please send me a picture of yourself and Mack wherever you go, so that I’ll know he is still travelling. Sadako Sasaki was born on 1943 January 7 in 広島 (Hiroshima, Japan). She was two years old when the U.S. dropped the atomic bomb on that city. When she turned twelve, Sadako was diagnosed with leukemia and was given less than a year to live. She had to stay in the hospital. While she was in the hospital, she began to fold 千羽鶴 (1000 Origami Cranes) which are a good luck gesture in Japan. Sadako folded any piece of paper she could find in the hospital into a paper crane. Hospital staff, other patients and friends and family helped her and gave her any paper they could. On 1955 October 25, Sadako’s mother made a special meal for her and gave it to her in the hospital. The last word Sadako Sasaki said before she died that day at age 12 was 「おいしい」 (“It’s delicious“). Sadako only managed to fold less than 700 paper cranes before she died. 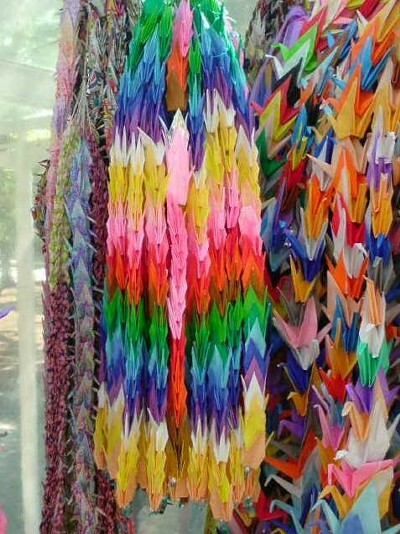 Her friends and family folded the rest and put all 1000 paper cranes in Sadako’s casket with her. Sadako Sasaki’s story has come to symbolize the need for world peace and there is a statue of her in Hiroshima. People often leave 千羽鶴 (1000 Paper Origami Cranes) at the statue.